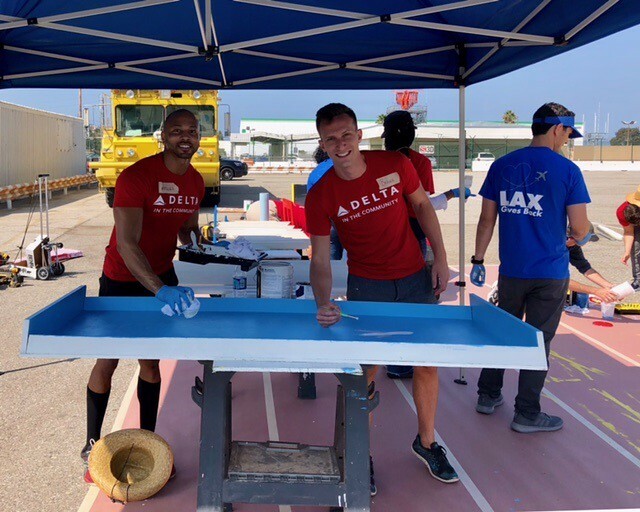 Delta’s Los Angeles-based In-Flight Service leadership team recently partnered with Los Angeles World Airports (LAWA) to build a playhouse for Habitat for Humanity. Twenty LA-based flights attendants and LAWA employees gathered on the ramp at the Flight Path Museum, where they teamed up to design and assemble the playhouse. The playhouse will ultimately be donated to the family chosen for this year’s Los Angeles home build this fall, the 8th home that Delta will build with Habitat for Humanity of Greater Los Angeles. The idea for the playhouse build first came from LAX-based flight attendant Debra Bergholtz.